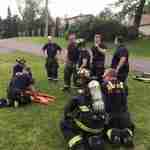 Tonight the members of West Lake had the opportunity to utilize West Ridge Fire Departments training tower and focus on RIT operations. 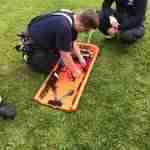 Members were able to package downed firefighter and practice using the departments new Fast Rescue Board. 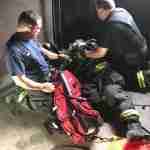 Officers were able to demonstrate the use of West Ridges new “smoke curtains.” A great training exercise for all. A special thank you to Chief Dan Ouellet and West Ridge Fire a Department for allowing the use of their tower.